This stink bug, Acrosternum hilare, was found feeding on developing seeds of Velvet Ash (Fraxinus velutina) along Rackensack Wash, Maricopa Co., Arizona, USA, Oct. 2009. Several kinds of mostly green stink bugs are found in the Sonoran Desert. Green Stink Bugs feed on a wide variety of plants focusing their feeding attention on tender buds and shoots and more often developing fruits and seeds. The Green Stink Bug is fairly common by summer and fall in the Sonoran Desert particularily on plants that are flowering or setting seed. They extract embryonic seed contents through their piercing-sucking mouthparts. The feeding may damage the developing seed inhibiting future germination. When disturbed they can discharge a sharp, acrid chemical that deters many insectivores. 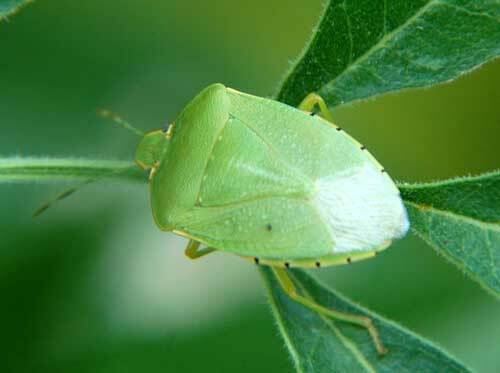 This species of Green Stink Bug is found through much of North America and is a significant pest in some crops. Gardeners will often find them on their cultivated plants.